This Slow Cooker Recipe Makes Some Of The Juiciest, Tender Taco Meat We’ve Ever Had! While this might not cut the mustard as an authentic carnitas recipe since we’re cooking everything in the slow cooker, it’s still mouth-wateringly good and you’ll be wanting more in no time! We love coming up with tasty, affordable recipes that people can get excited about, and this one is a real winner. It’s filled to bursting with flavor, the meat is juicy and tender, and the seasoning is perfection! We like to make this dish for our family taco night, but you can also make this (easily) for parties, family get-togethers and sports events. Don’t take our word for how good these aretry them and see for yourselves! Generously season pork shoulder with salt and pepper. In a small bowl, whisk together olive oil, cumin and oregano and rub mixture all over pork. Place pork in the bottom of slow cooker and arrange 1 chopped onion, garlic and jalapeño around it. 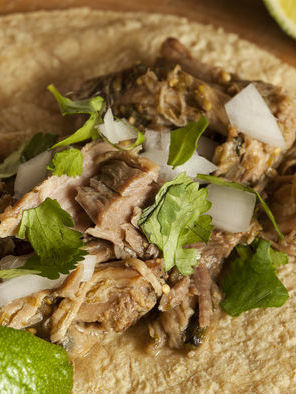 Squeeze the lime and orange halves over the pork and add the outer skins to the slow cooker. Cover with lid and cook on low for 8-10 hours or on low for 4-5. Once tender, let cool for 20 minutes, then use 2 forks to slowly shred the pork. Heat 2-3 tablespoons canola oil in a large, cast iron skillet over high heat. Once hot, add shredded pork and cook in a single layer until crispy, 3-5 minutes. Warm tortillas in a separate pan and, when ready, fill tortillas with crisp pork, remaining chopped onion and fresh cilantro.